Joel Talley was born on March 9, 1948, in Indiana. He enlisted in the U.S. Air Force on March 16, 1967, and after completing Air Force Pararescueman training, he served as a Pararescueman with the 37th Aerospace Rescue and Recovery Squadron (ARRS) at DaNang AB, South Vietnam, until February 1969. His next assignment was as a Pararescueman with the 57th ARRS at Lajes Field, Azores, Portugal, from February 1969 to June 1971, followed by service with the 55th ARRS at Eglin AFB, Florida, from July 1971 to August 1975. Sgt Talley served with the 40th ARRS at Korat Royal Thai AFB, Thailand, from August to December 1975, and then with Headquarters Aerospace Rescue and Recovery Service with duty at Selfridge Air National Guard Base, Michigan, from December 1975 to July 1977. He next returned to the 55th ARRS at Eglin AFB, where he served as a Pararescueman, as NCOIC of Pararescue Scheduling and Training, and as Assistant NCOIC of the Pararescue Section from July 1977 to August 1979, followed by service as Assistant NCOIC and then NCOIC of the Pararescue Team with the 33rd ARRS at Kadena AB, Okinawa, from September 1979 to September 1982. 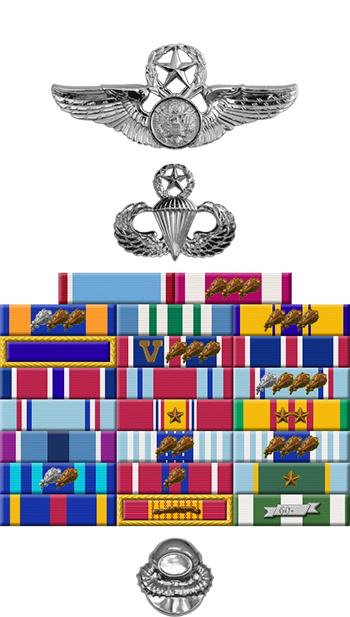 CMSgt Talley served on the Combat Operations Staff, as Chief of the Pararescue Branch in the Tactics and Techniques Division, and as Superintendent of Pararescue Plans and Policy with Headquarters 23rd Air Force at Scott AFB, Illinois, from September 1982 to July 1988. His next assignment was as Senior Enlisted Advisor for U.S. Forces Azores from July 1988 to January 1992, followed by service as Senior Enlisted Advisor for the 39th Special Operations Wing and the 352nd Special Operations Group at RAF Alconbury, England, from January 1992 to March 1995. 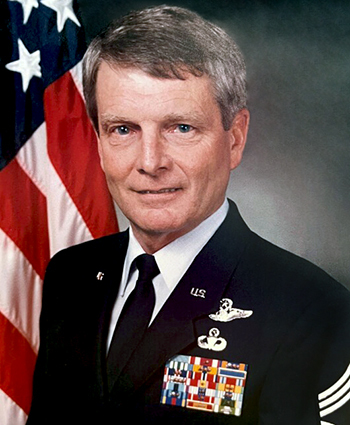 His final assignment was as Superintendent of the U.S. Air Force Special Operations School at Hurlburt Field, Florida, from February 1995 until his retirement from the Air Force on April 1, 1997. The President of the United States of America, authorized by Title 10, Section 8742, United States Code, awards the Air Force Cross to Airman First Class Joel E. Talley for extraordinary heroism in military operations against an opposing armed force as Rescue Specialist on an HH-3E helicopter in Southeast Asia on 2 July 1968. On that date, Airman Talley volunteered to be lowered to the ground from a hovering helicopter into the jungle of North Vietnam to rescue an injured pilot, who had ejected the previous day. The downed pilot had parachuted into a concentration of North Vietnamese Army regulars who immediately surrounded him and set up gun positions to trap the forthcoming rescue helicopters. Four rescue attempts were driven off, and a supporting fighter aircraft was shot down by the devastating ground fire which encircled the survivor's position. Despite full knowledge of the well laid trap, Airman Talley voluntarily descended to search the jungle floor. After an extensive search he found the helpless survivor, carried him to the rescue device, and signaled the helicopter to commence extraction. While Airman Talley and the survivor were being hoisted, a fusillade of fire raked the helicopter scoring more than forty hits, forcing the helicopter to exit the area, exposing both airmen to hostile fire. The rescue was successfully accomplished. Through his extraordinary heroism, superb airmanship, and aggressiveness, Airman Talley reflected the highest credit upon himself and the United States Air Force.